This title has been interesting with twists and turns around each corner. If you haven’t been following, the second page speeds you up on what’s going on so far. This issue focus’ on the trio trying to get closer to the Rover gang, and to figure out who their supplier is. I like how Del Col is slowly taking his time with the story and fleshing out the characters. Nancy is definitely in the driver’s seat this issue, and focus’ on her. The inner monologuing by Nancy is superb, as to her mental state, and if the cops are doing their jobs. The Hardy Boys themselves play second fiddle to her, and I’m fine with it, because they use their skills to help her out while still having her be the star of the show. The story actually wraps around to the beginning, and it makes sense. It’s kind of obvious how it happens, but it works within the story. The dialog is strong and keeps you enthralled in the story. Pacing wise the story is a bit slow, and there are points where you don’t know what time it is. I’ve been reading this series since issue one, and I don’t think there’s ever been daylight, except for the flashbacks. The art by Dell’Edera is good, as it has a noir feel to it. This is a dark book, and uses a lot of shadows within the title. Characters look fine, and the art seems to look better in some areas of the title. The environments aren’t bad, and work with the panels. There was some nice use of watercolors in one page, and it looked great, but that one page, threw me for a loop. I’m not sure who worked on that page, but it looked phenomenal. The colors by Simeone look fantastic, and meshes with the dark tone of the story. He has a nice color palette going on, that ebbs and flows throughout the title. The lettering is fine, and not distracting in the title. It’s put in places where you can see the cool looking artwork. 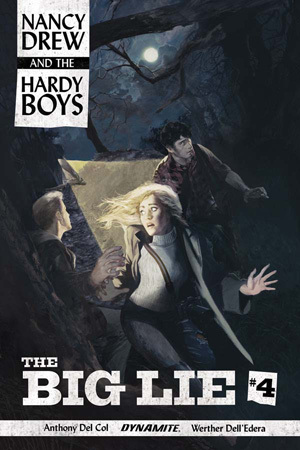 Overall, Nancy Drew and The Hardy Boys: The Big Lie #4 is a good title that if you’re a fan of the characters you might want to check out.